When it comes to MR computer packages, continuous data, panel data (and the ability to merge data from different sources on a regular basis) call for a level of sophistication that you will not find in any off-the-shelf solution. Rather than look outside, ACNeilsen, Information Resources and TNS Harris have gone to the considerable effort and expense in developing their own software solutions to these problems. There are some very interesting differences in their approaches, though two threads are constant: establishing consistency in reporting, so that everyone is looking at the same information, and providing accessibility to the most up-to-date set of data at all times. Robert Buckeldee, Business Unit Director at ACNeilsen, explained "We conducted some research among our customers. It was evident to us that the impact of barcode data meant more data: frequency, proportions, demographics and different sources of data. More data was giving our customers less insight not more. They needed some vision and some tools to help them. "With Integrity and Workstation Plus, we took a two pronged approach: a pre-processing activity and then a data deliverable activity." ACNeilsen's Integrity database combines retail data, typically barcode data direct from retailers with consumer panel data to give a more complete picture than either can on its own. Success depends on aligning different sources of data on the same item: in this case the actual barcode. Data from retailers, consumers and potentially other sources can be matched and used side-by-side. At the delivery stage, ACNeilsen recognised that different data consumers had different needs, so worked on delivering information in what Buckeldee calls "slices of variable thickness." Workstation Plus is driven by templates that unlock different views of the data for different users. It determines how much of the data may be viewed as well as what users can do with it, from viewing ready prepared reports through to interrogating the actual data. It runs as a Windows application on the end user's PC, and each new reporting period automatically refreshes all the data and reports. The tool also contains an automatic highlighter which emphasises any dramatic changes since the previous reporting period. It is a bold attempt to overcome the very real problem of information overload. Information Resources are also producing a new generation of continuous and multiple source data tools under the heading "Analyzer Publishing". In IR's case, there has been a conscious effort to exploit Internet technology and tools that would be familiar to its users. Reports are viewed using a standard web browser, and charts appear as embedded Powerpoint or Excel objects. Like Workstation Plus, reports are tailored to individual users' needs and a lot of the technical mastery takes place behind the scenes. What makes this a particularly effective solution for continuous data is the way each new reporting period is released. At "Publishing" time, each user selects various update options from a drop down menu in Powerpoint. These allow them to update their own individual set of charts and tables when they want to and in the way they want to. As each data item is tagged, it automatically copes with all the routine changes that are completely beyond the capabilities of most analysis tools, such as new brands appearing or names changing, and then redraws all the tables and charts to match. Richard Downs, IR Consultancy Services Director says: "It provides one point of shared access. In the past, you may find manufacturing and sales using different reports. This is all about establishing consistency." Miriad (Managed Integrated Research Information And Database) from TNS Harris takes the process of integration further by bringing data together from many different sources, as the name implies. David Holden, Deputy MD of TNS Harris, says: "We can effectively build a marketing database of survey and external data sources: sales information, marketing information, brand awareness, competitors' ad spend, customer satisfaction. What we are offering to the client is the opportunity to maximise their ROI on survey and data gathering by bringing all the data together and also providing an internal distribution tool through which they can demonstrate to their internal clients and management the value of this investment." A key part of this process is to standardise on reporting methodology, and TNS Harris clearly see Miriad as the tool their clients should be using in this process. 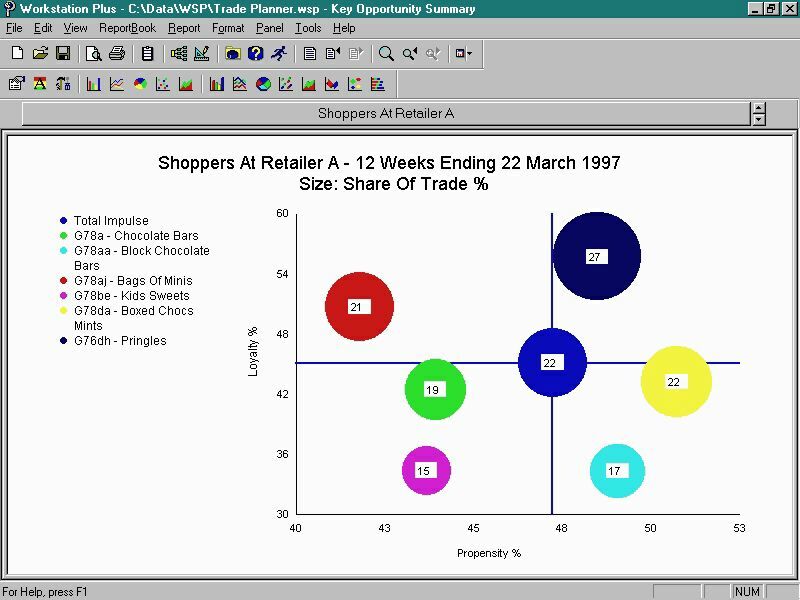 To the end user, Miriad is a point and click Windows application which allows them to interrogate their data and view the results as either charts or tables. You can even create a slideshow of selected charts and tables for a presentation, or release these electronically to a wider audience. Once again, it is possible to control who has access to what in terms of data, and also in terms of who can analyse the data and who can just see the results. With additional modules in the pipeline for modelling and multivariate analysis, this tool is clearly aimed at the professional researcher, but the ability to publish results means findings can percolate through the entire organization. The irony, among all the talk of consistency and standardisation, is that each company has taken a largely proprietorial approach to its development. If an organization chooses to standardise on any one of these offerings, then it is locked into a relationship with that supplier in order to be allowed to use the software. If support for continuous data and integration of different data sources remains virtually non-existant in mainstream mr software packages, the long term effect of these 'own brand' packages across the industry could be less rather than more standardisation. Published in Research, the magazine of the Market Research Society, November 1999, Issue 402.